Wet-laids media are made with short fibers suspended in a fluid. The fibers are deposited onto a screen or porous surface to remove the fluid and the web is then consolidated mechanically, chemically, or thermally. Wet-laid materials have outstanding uniformity when compared with other nonwovens. The most widely used medias today are produced on a paper machine with cellulose, synthetic or glass fibers. Cellulose-based media is generally lower cost with nominal efficiencies above 5 μm and low dirt holding capacity. 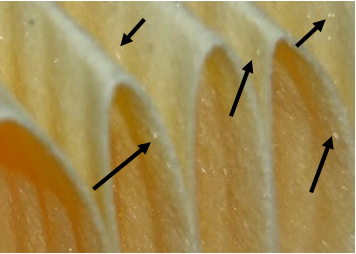 Cellulose fibers are coarse and flat which produces a dense high pressure drop. A typical wet-laid cellulose medium is shown below in example 1. Another variation of wet-laid media blends synthetic fibers to cellulose. This will significantly improve the filtration performance by opening up the structure and adding finer cylindrical fibers to the pattern which do not surface load as readily. A wet-laid cellulose/synthetic blend medium is shown in example 2. ​ The photo in example 3 hows tiny shiny fibers of synthetic blended in cellulose that is used in many of HENEK's products. Microglass and/or polyester can be added to a cellulose media grade to increase the bursting strength of the media for lube applications. There are certain industries (i.e. Industrial Air, Gas Turbine, etc.) that specify a specific polyester or glass content for increased performance in their product. These industries are looking at features like lower restriction, better dirt holding capacity, increased durability for back-pulse applications and high psi ratings. Of course, these features are impacted in the overall cost of the mix of fibers, but still remain more cost effective than 100% microglass.